A classic example of a Georgian Period ring. The 21 rose-cut diamonds are set in silver with an 18k rose-colored gold shank. The intricacies of the hand-made repoussé metal work and its pristine condition will supersede the quality of the diamonds and set the price. (However, the fact that the diamonds aren’t chipped or abraded is a plus). Photograph by Cole Bybee. Image courtesy of Lang Antique and Estate Jewelry. You’ve decided modern engagement rings with glitzy bling aren’t for you. They lack uniqueness. Instead, the allure of antique engagement rings has piqued your wandering interest. They have an unmistakable character and style about them that modern rings decidedly miss. However, before you purchase one, you need to know more about these one-of-a-kind, instant heirlooms. This question has generated quite a bit of debate in the jewelry world. In the past, jewelry appraisers said a ring must be 100 years old to be labeled an antique. This year of demarcation has been relaxed in recent times. Now, appraisers declare a ring must be only 50 years old. We’ll compromise. In this article, we’ll cover rings made before 1930, which marks the end of the Art Deco jewelry design period. How Do You Know How Old a Ring Is? Qualified appraisers and gemologists can assist with dating a ring. If you want to purchase an authentic ring from a design period, deal only with a reputable antique jewelry store. Be wary of rings marked as reproductions, modern rings made to resemble antiques. A reputable vintage ring dealer will guide you in the identifying the difference. Below are some of the characteristics that can help identify a ring’s age. The first calling card of a ring’s production date is its overall style, ornamentation, and symbolism. Graceful lines, bold patterns, and depicted scenes can help pinpoint age. Historical and cultural events can also drive motif. For example, the 1800s saw an influx of designs inspired by archeological finds from the opening of Egyptian and Etruscan tombs. Faceting styles and the shapes of cut diamonds and other gemstones in rings will help pinpoint their era. Watch for these important cutting styles when examining antique engagement rings. Table Cut: a square shape with a large flat top and few facets. One of the earliest cuts, not commonly seen. Rose Cut: a rounded shape with a flat bottom and a domed top and few facets. One of the earlier cuts, premiered in the 1500s, enjoyed a revival in rings made in the 1800s. Step Cut: a square or rectangular shape with long facets. Used from the 1800s through modern times. 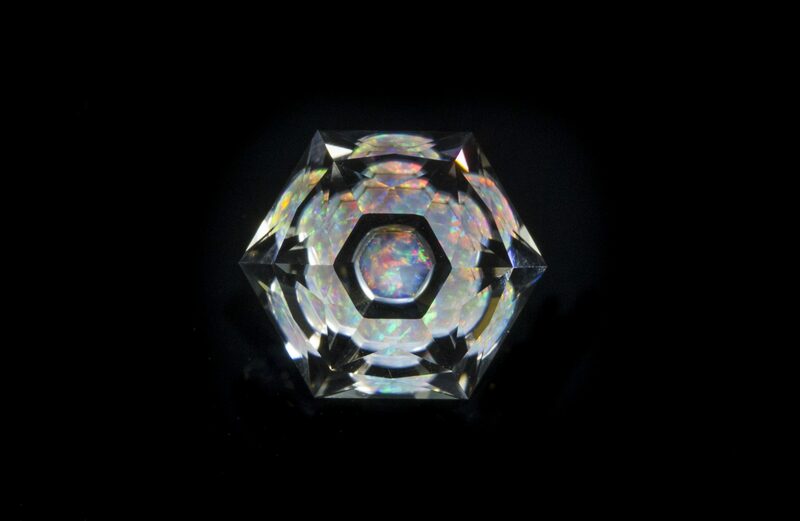 Old Mine Cut: a rounded square shape with decidedly more facets than the table and rose cuts. Rings dated from the 1800s through early 1900s will often feature gems with this style. Old European Cut: a round faceted shape, a precursor to today’s modern round brilliant cut. Clunkier than the modern round, you often find it in rings dated through the 1900s. 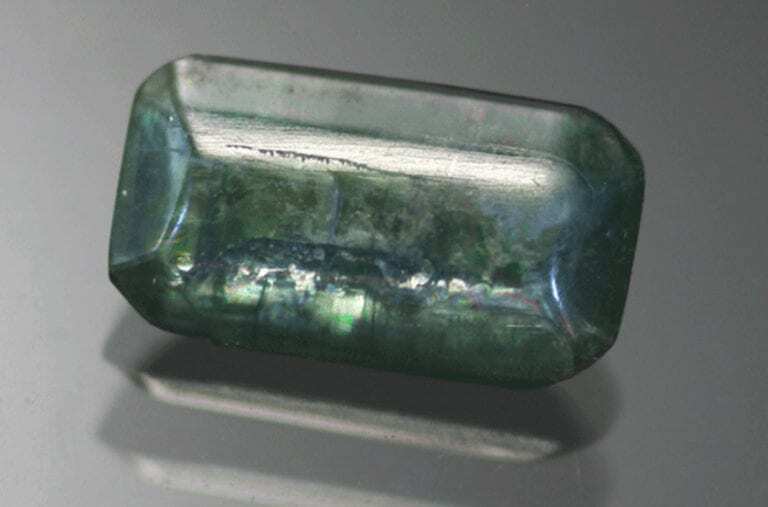 Many varieties of gems have been available as ring stones for centuries. However, their popularity waxes and wanes based on color and fashion. For example, Queen Victoria liked blue. Thus, turquoise was en vogue during her reign. On the other hand, some gems appear to have unwavering interest. Rubies, sapphires, and emeralds enjoyed great popularity throughout the eras we’ll cover. The metals or combinations of metals used in fabrication can also help date the ring. For example, in the 1700s, jewelers sometimes used silver to set diamonds. 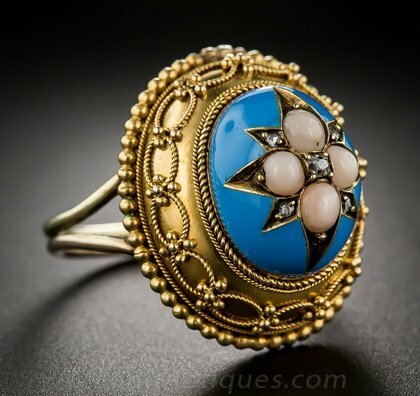 This bold Mid-Victorian ring features the coral, enameling, and Etruscan motifs commonly used during this period. Small, rose-cut diamonds in an 18k yellow gold mounting accent the coral. With no chips or breaks, the enameling adds value. The detailing of the Etruscan beading, using valuable 18k gold, is sublime. This ring retails for $1,750. Photograph by Cole Bybee. Image courtesy of Lang Antique and Estate Jewelry. How Do Modern and Antique Engagement Rings Differ? While an antique ring can make a beautiful alternative to a modern ring, consider these three important differences between them. Today, the famous 4 Cs of diamond grading constitutes a common diamond language between buyer and seller. However, the Gemological Institute of America (GIA) established this standard in the 1950s. Diamonds in antique engagement rings created prior to that were evaluated differently. For example, in the 1700s, diamond rings only came out to play by candlelight. Yellower diamonds were common. The technology to cut diamonds to today’s exacting proportions didn’t exist. Thus, old rose cuts, flat on the bottom and domed on the top with few facets, seriously hampered diamond brilliance. In contrast, today’s round brilliant cut has 58 facets, laser cut to specified proportions to unleash maximum brilliance. Having gemological laboratory reports accompany all center diamonds in engagement rings is an even newer phenomenon. Most likely, you won’t find reports extolling the color, clarity, carat, and cut grades of diamonds in an antique ring. Some antique rings will have a report, but only if the center diamond can be removed from the mounting without damaging the setting. Antique jewelry may show signs of being “loved.” The owners of these pieces have probably handed them down through generations. They will most likely show some wear. However, this also aids in establishing the authenticity of the ring. Careful, though. Too much “love” can also devalue the ring. 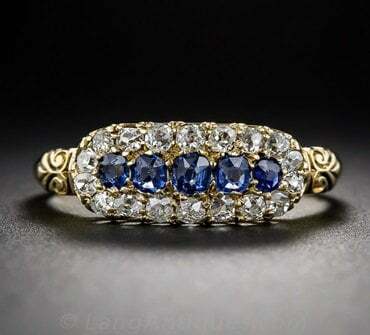 This Mid-Victorian ring features five cushion-cut sapphires, totaling 0.55 cts, ringed by 18 old mine-cut diamonds, totaling 0.55cts, in an 18k yellow gold hand-engraved shank. 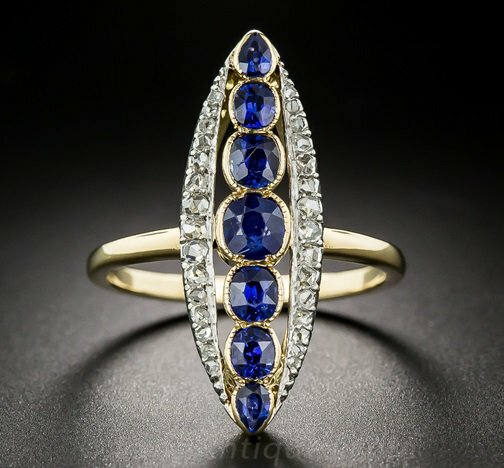 The rich, velvety blue of the well-matched sapphires and the uniformity of the old mine cuts set the price. The hand-engraved shank helps as well. Photograph by Cole Bybee. Image courtesy of Lang Antique and Estate Jewelry. Now, let’s get an overview of the chief characteristics of some of the most well-known jewelry design periods. This can help you focus your search for the antique engagement rings perfect for you. During the Georgian Period, intricate metal work depicting natural themes came into fashion. This was called repoussé. In addition, the use of faceted gemstones became the new rage. Flowers, butterflies, ribbons, and scrolls. Table, rose, and old mine cuts. Popular ring stones included diamond, garnet, emerald, topaz, and amber. Jewelers often set gems in closed settings with foil backing for enhancement. (If you acquire such a foil-backed Georgian ring, take special precautions. Contact with water can ruin the foil). Silver over 18k gold; 10k, 18k, and 22k yellow gold; and pinchbeck (83% copper and 17% zinc). Rings from the Georgian Period are very rare. Queen Victoria reigned for a long time. Thus, jewelry historians usually break down this era into three periods: Early (or Romantic), Mid, and Late Victorian. The rings of the Early Victorian Period reflected the love the young queen had for her husband, Albert. Victoria’s love of diamonds fueled their popularity. During this period, placing the bride-to-be’s birthstone in the engagement ring became fashionable. The 1840s saw the start of large-scale jewelry manufacturing. However, jewelers were still making many pieces by hand. Based on detail and condition, hand-fabricated pieces will command a higher price in today’s antique market. Popular ring motifs included snakes as symbols of eternal love. (No, really). Other fashionable motifs included: angels, love knots, and crosses; Celtic, Greek, and Roman designs; and clovers and flowers. Rose, old mine, and step cuts. Diamond, amethyst, pink and gold topaz, coral, turquoise, ruby, and carved cameos. Silver; 18k and 22k gold in various colors; rolled gold (gold plating over a base metal); and pinchbeck. During this tumultuous period, Queen Victoria’s husband passed away and the Civil War raged in America. Dark and heavy rings often reflected a state of mourning. After the discovery of diamonds in South Africa in 1867, jewelers used them frequently. In addition, the California gold rush flooded the market with gold. Acorns, bees, birds, flowers, geometric patterns, and stars; Etruscan (fine granulations) and Egyptian designs; and enameling. Garnet, diamond, emerald, black onyx, pearl, opal, jet, and black glass. Silver, steel, and 9k, 10k, and 15k gold. Rose-colored gold in all karats became exceedingly popular. During this design period, rings became more airy and light compared to Mid-Victorian pieces. Up to this point, most engagement rings were clusters of gems. 1895 saw the solitaire engagement ring gain popularity. Platinum entered the scene as the luxury metal of choice. Crescents, horseshoes, moons, oak leaves, and trefoils; double hearts with crowns or knots; bows and ribbons; and navette or marquise-shaped rings. Old mine and rose cuts. Amethyst, aquamarine, emerald, peridot, chrysoberyl, ruby, sapphire, moonstone, and opal. This Late Victorian ring has a classic navette shape. It features seven sapphires, totaling 2.00 cts, accented with 30 platinum-mounted rose-cut diamonds, totaling 0.25 cts, and an 18k gold shank. The vivid blue, well-matched sapphires have descending uniform sizes. They set the price, along with the hand-fabricated platinum mountings for the diamonds. (The diamond weight helps, too). The ring retails for $5,850. Photograph by Cole Bybee. Image courtesy of Lang Antique and Estate Jewelry. In this age of the artisan, jewelers considered themselves artists. Their beautiful creations were fluid and graceful. 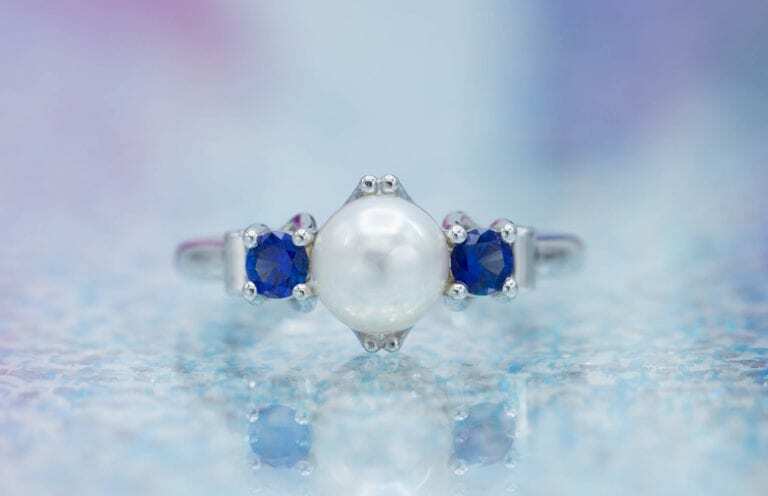 Although jewelry pieces such as pins, necklaces, and hair combs better capture the beauty of Art Nouveau, you still find wonderful rings in the antique market. Popular motifs included fluid lines and depictions of nature. Enameling, especially plique-a-jour, was a popular technique. Old mine and old European cuts. Tourmaline, small diamonds, pearl, emerald, opal, amber, lapis lazuli, moonstone, carnelian, and synthetic gems. Platinum, silver, and white and yellow 14k and 18k gold. This Art Nouveau ring reflects the natural motifs typical of this period. The 2.50-ct cushion-cut diamond is set in oxidized silver over a gold mounting, with gold prongs stretching to anchor the diamond. The diamond determines the price, but the beautiful metal work lends value. Photograph by Cole Bybee. Image courtesy of Lang Antique and Estate Jewelry. Although the Edwardian Period overlaps Art Nouveau, each gets treated as its own design period due to their distinctive styles. Known for their graceful and airy nuances, Edwardian rings used open wire designs and filigree. Platinum use surged due to the metal’s unparalleled strength. It enabled jewelers to create delicate and lacy mountings. Enameling became immensely popular. Rings from the Edwardian Period should have a hallmark (metal purity) and/or a maker’s mark (firm responsible for production). You’ll find them stamped inside the shank. Bows, ribbons, moon and stars, flowers, leaves, and shamrocks. Rose, old mine, and old European cuts. 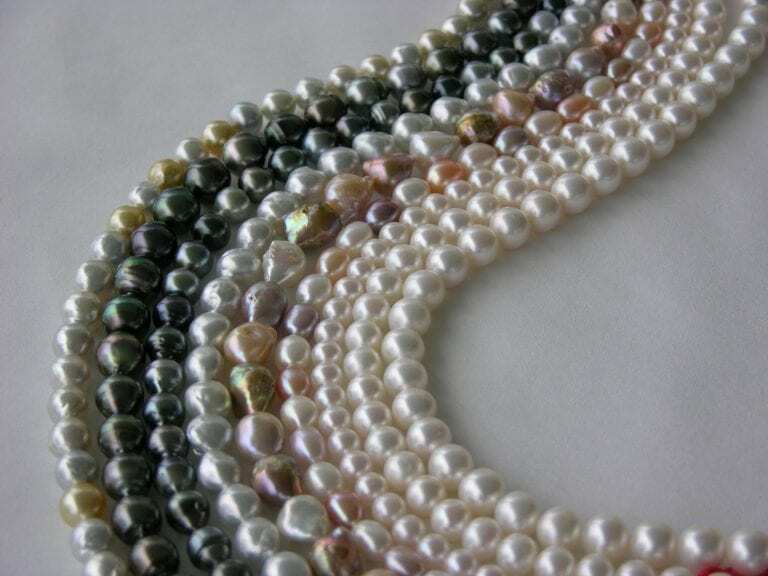 Pearl, diamond, peridot, emerald, sapphire, ruby, opal, moonstone, and mother of pearl. Silver, platinum, rolled gold, and gold (especially 18k) in multi-colors. This Edwardian ring captures the airy quality of this period’s style. It features a 0.73-ct J color VS2 clarity old European-cut diamond set in a platinum, floral motif-engraved mounting. The ornateness and the pristine quality of the engraving and filigree are fantastic. However, the diamond sets the price in the ring. Photograph by Cole Bybee. Image courtesy of Lang Antique and Estate Jewelry. 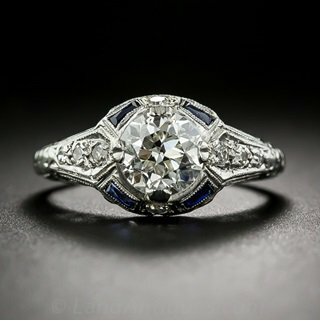 Currently, Art Deco rings rank as the most popular (and abundant) antique engagement rings on the market. These pieces feature bold geometric patterns and colors, filigree and millgrain work, and lots of resplendent diamonds! Nothing exemplified this era of unheralded opulence, wild abandon, and faith in progress more than sprays of diamonds. Popular motifs included geometric patterns as well as designs influenced by Egyptian, African, Oriental, and American Indian art. Enamel accents were popular. Old mine, old European, and step cuts, as well as new styles of shield shapes and caliber cuts. Diamond, emerald, sapphire, ruby, black onyx, crystal (quartz), ivory, jade, mother of pearl, and synthetic gems. Platinum, silver, white gold, chrome, and marcasite. This Art Deco ring showcases all that is glorious of Art Deco rings. Its millgrain-engraved platinum mounting highlights a 1.31-ct old European cut of J color and VS2 clarity in the center. Caliber-cut sapphires serve as accents. The center and accent diamonds as well as the platinum all establish the price of the ring. Note also the excellent condition of the sapphires. This ring would retail for $9,950. In contrast, a modern round brilliant-cut 1.30-ct diamond of J color and VS2 clarity would retail from $8,000 to $10,000. (Just for the diamond). Photograph by Cole Bybee. Image courtesy of Lang Antique and Estate Jewelry. Can I Keep the Ring but Replace the Gem? 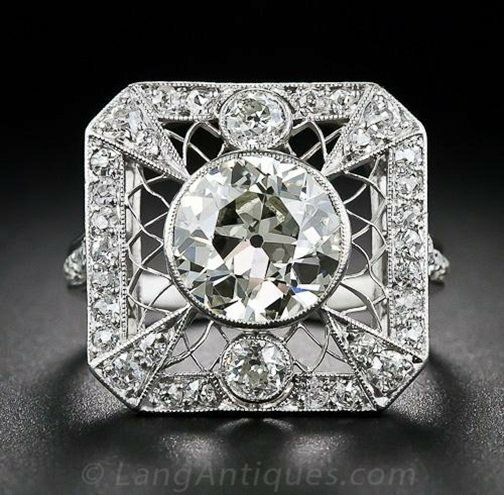 Do you like the look of the Art Deco ring above but want to replace that old European-cut diamond with a modern brilliant round? Just move along, then. Replacing the center diamond would compromise the integrity of the piece and destroy its aura of timelessness. Perhaps you should consider a modern engagement ring with an antique look. Tacori engagement rings capture this beautifully. A whole new world of antique jewelry awaits you. Make sure you shop at reputable stores, whether brick-and mortar or online. Remember, you’ll likely encounter many reproductions on the market. Gemologists and appraisers can help you select an authentic piece. Lang Antiques is knowledgeable, accessible, and has an immense collection. 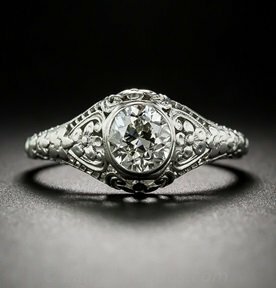 Brilliant Earth also has an extensive collection of vintage and antique engagement rings. 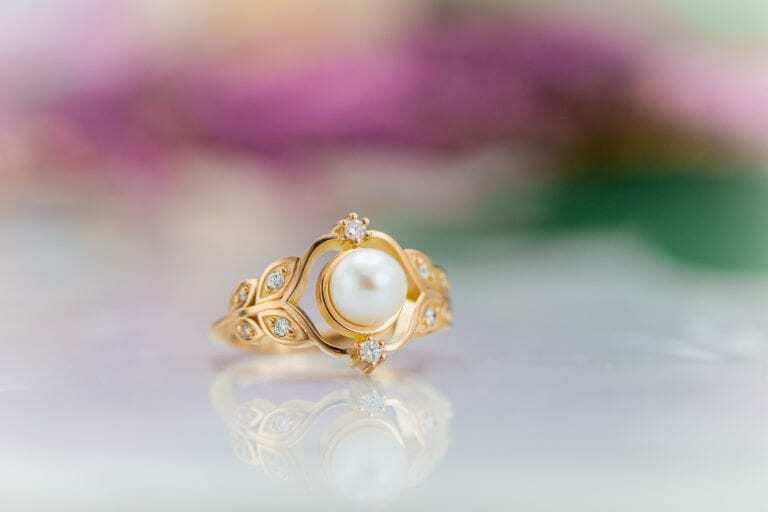 If you prefer a new, unique ring in an antique style, check out the custom jewelry makers listed in the IGS Business Directory. 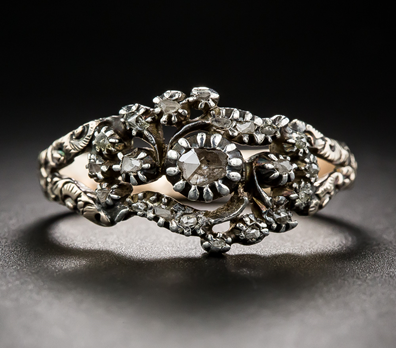 This Edwardian ring highlights the intricate, platinum lattice work common in jewelry of this period. 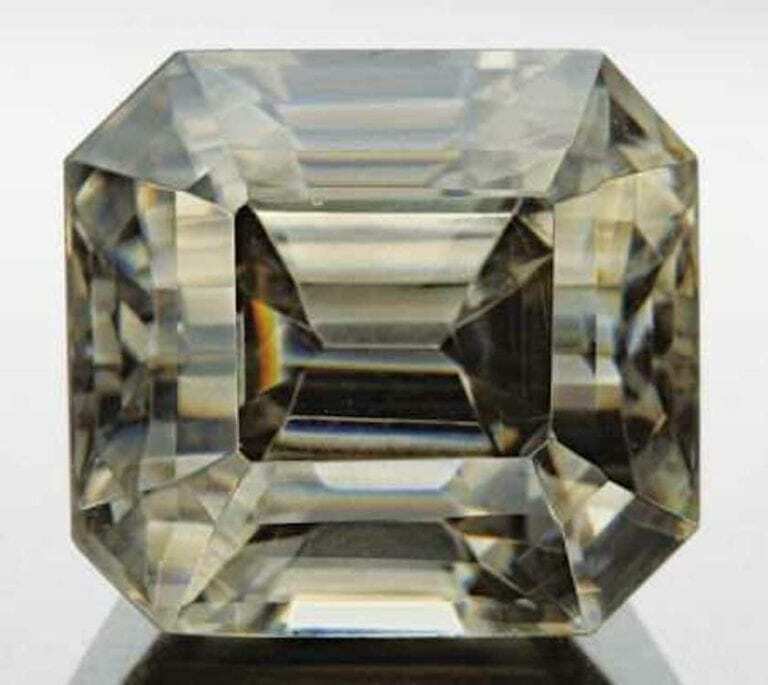 The old European-cut diamond weighs 2.20 cts, has L-M color, and a SI1 clarity grade. The accent old mine-cut diamonds weigh a total of 0.55 cts. The weight of the center diamond determines the price, though the accent diamonds contribute. However, the intact intricate platinum work, as well as the metal itself, plays a major role. Photograph by Cole Bybee. 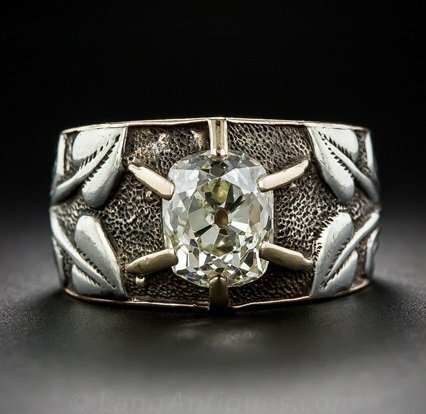 Image courtesy of Lang Antique and Estate Jewelry.